We welcome back the Sage for his take on Sleepless in Seattle. 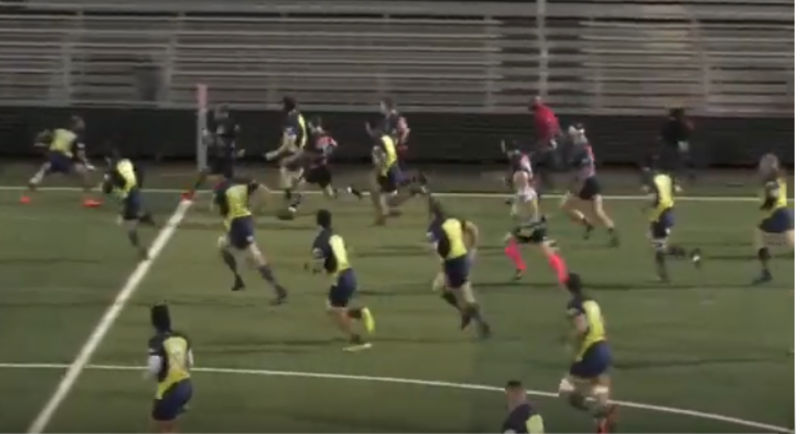 "After some good discussion during the week with the Saracens brass about field options and quality, they suggested night games at Starfire Turf Field. This proved to be a great solution that traveling teams might want to try. In all, it made for a ‘comfortable’ day. The 9:00 a.m. ferry, arriving in time for a good warm up and 4:30 and 6:15 ko’s on a very good turf field/stadium under the lights, back to the hotel and a night of celebration and camaraderie. For the Divvies a deal of physical play was absorbed during an all-out eighty minute battle with a big and fast Saracen Reserves side. CW sets were solid early and continued throughout although it was not without a few front row injury subs ‘manning up’. CW line outs were strong with two catch and drives resulting in tries. New comer, Haydn Jenkins was perfect in the air (one try to his credit), with a line-out jumping performance that will be the talk of viewers when supporters get a chance to see him at Windsor. Quinn Horton was a ball carrying machine all game and put the quick footed backs on attack. While the big Saracens pack was expected to slow down in the second half, this was not the case! The second stanza saw the pace and physicality continue. CW backs performed well and if it was not for an intercepted pass while attacking the red zone the end result might have swung in favour of the visitors. (Home Ed. – “dam”!) It was a battle to the end, a well-earned two bonus point loss by the lads. The video highlights of the night out in Seattle are not available! 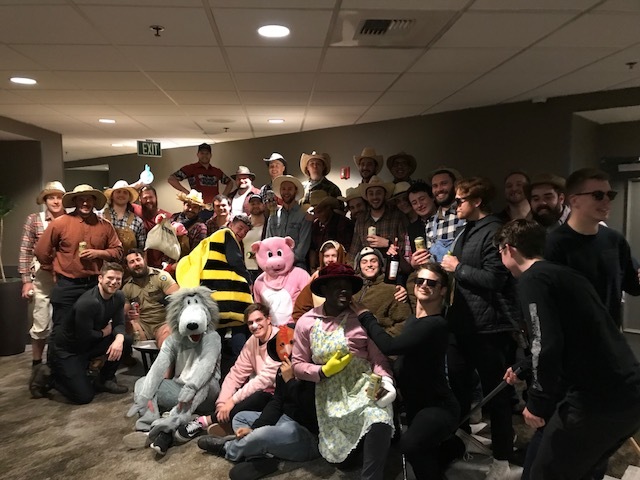 Suffice to say, this year’s theme of the “Farmers Tale”, Farmers (all players over 24) and Barn Yard Animals (all player U24) was enjoyed by ALL. The morning’s head-count reconciled and it was home again, jiggedy-jog, all accounted for and songs and tales of brave acts during the bus ride to the ferry." (The Sage). After a week of muddy, wet practices and the loss to Westshore still in their minds, the CW women hit the pitch on Saturday in Burnaby. Burnaby crossed the try line first after capitalizing on a CW penalty, arguably somewhat against the early flow. The Tricolors did not let the early deficit discourage them. Kelcey Leavitt responded with her first strong run of the game breaking through the Burnaby line and carrying to Burnaby territory. This carry was to ultimately lead to a CW try, after a couple of assorted kicks late, from Folk and Bazain, aided by a Burnaby penalty, the visitor’s, Gabby Torres tied the score. CW put in some good work, particularly with defence however penalties somewhat undid this good labour and Burnaby answered, score-line, 10-5. Possession exchanged many times, but it was to be Bazian with her dancing shoes who faked out the defenders to gain valuable territory. Following a lineout, ten meters out, the CW forwards mauled and scrum half, Folk scuttled in for the try to tie the score. The final ten minutes of the half saw strong runs by Danika Pedrick, Ciara Malone and Maze, and a final try by Sya Trafford, 15 – 10 for the visitors. The second half of the game began akin to the first half with Burnaby possession. The Lakers pressure resulted in a try in the corner by Van Vugt for her brace to tie the game. The second half of the game was played hard and physical, but the Tricolours could not finish. Lauren Sargent made an amazing seventy meter run straight down the side line. Despite hard work and tenacity displayed by many players, especially by Ada Okonkwo, CW became plagued with this inability to finish. After many attempts to score within the Burnaby twenty-two, the visitors turned the ball over and with a series of fast movements from the the rucks, Burnaby scored, making it 20-15 and a hat trick for Van Vugt. CW tried to make up the deficit but it was not to be. The physicality and intensity by CW on both offence and defence improved tremendously. All players showed greater confidence with ball in hand. Way to go, ladies! The players of the game were forward, Kelcey Leavitt and back, Maddy Graham. Both displayed ‘attitude’ in their game and were leaders on the field. Congratulations to Burnaby and thanks to the day’s officials. Next up, UBC at Windsor, Feb., 9th. (Jamie Beck). Postscript – Shout out to Seattle Seawolves in their opener, 20 – 18, a repeat of last year’s Final Vs Glendale with Canada’s, Brock Staller, M-o-M.